Roomba - today at Woot! Good robot. Good robot. Now sit. A not so moving post about moving. I spent most of yesterday, and in fact a lot of the past week, in the small closet which is really a sauna that is our pantry. Adam already explained that we don't yet have a/c, so the kitchen, and especially the tiny pantry, is sweltering. I'm quite sure I've sweated away pounds while lining the shelves, organizing cans, and shoving pots and pans onto high shelves. Perhaps we should have thought of this dual-use early on and put in a little bench? Then I could've really relaxed in there. The pantry was a major dream of mine and, in a few kitchen layout revisions, nearly got lost. 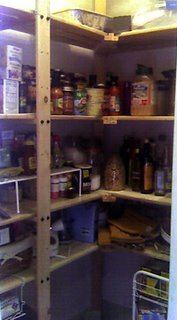 But I protected it fiercely, because frankly I can't reach most of our upper cabinets and knew that we wouldn't have too much other cabinet space to work with. 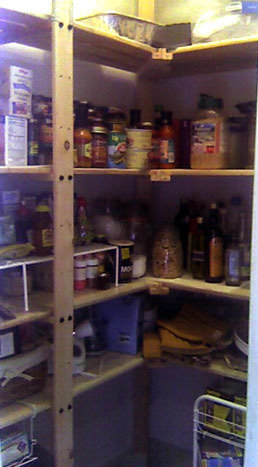 So the pantry was designed to hold all of our food, plus large pots and pans, recycling, brooms/mops, and paper goods. In other words, just about the whole kitchen fits into our little 4'x3' room. And amazingly, it really seems to work. There are a few problems, of course, which are symptomatic of the whole combining households thing. Suddenly we do have two of nearly everything, and not enough space for both. This is evidenced by the two large soup pots we have each with their own vegetable strainer insert - nearly identical. Do we really need both? Ditto for the two sets of pyrex baking dishes (one rectangle and one square each). Apparently there are some things that are just standard kitchen issue. And then there's the copious amounts of tea. Very odd because I don't drink tea at all and I can't remember Adam drinking tea either, except when sick. But between us we have over a dozen different boxes plus some odds and ends packets - lots of interesting flavors, too. So please, folks, come over for some tea. Nevermind that it's 95 degrees outside. Maybe we'll give you an ice cube or two from the new icemaker. Ah - the icemaker. It's still a bit of a marvel to me. I don't think I've ever lived in a house with an icemaker; my mom is a bit of an ice purist and we never had one growing up, and I certainly haven't lived in such luxury in my apartments since leaving the house. But now we've got an abundance of ice - as if there were an ice sorcerer's apprentice - it just keeps coming and coming. I thought it was supposed to stop producing when it filled the bin? I guess I need to read the fridge manual to figure out how to regulate the amount of ice it makes because we for sure can't use it up as fast as it's coming. Overall, very very happy with the kitchen. Just another box or so (plus a few more loads of dishes as they're coming out of the boxes - yeah, I'm sorta crazy that way) and we're all unpacked. It's really amazing, there were plenty of times that I couldn't even imagine being at this stage. What a relief! Comments on "The sauna that is our pantry"
Ah yes, the glory of icemakers. They are one of the great inventions of the modern age. You really should consider making great vats of ICED TEA!!! -signed, just learned that the icemaker in our newly purchased house refuses to actually make ice and therefore needs to be fixed/replaced.